The galaxy cluster at the center of this image has so much gravitational force that it warps and distorts our view of everything behind it. This photo offers a particularly dramatic example: look at that twisted galaxy on the right. The closer cluster's gravity will act like a huge lens, pulling images of the distant galaxy around the sides and greatly distorting them. This is just the case observed in the above recently released image from the CLASH survey with the Hubble Space Telescope. The cluster MACS J1206.2-0847 is composed of many galaxies and is lensing the image of a yellow-red background galaxy into the huge arc on the right. Careful inspection of the image will reveal at least several other lensed background galaxies — many appearing as elongated wisps. 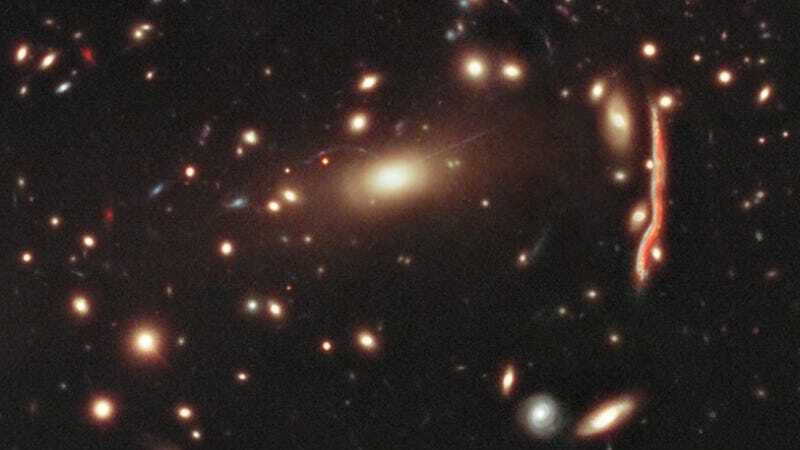 The foreground cluster can only create such smooth arcs if most of its mass is smoothly distributed dark matter — and therefore not concentrated in the cluster galaxies visible. Analyzing the extent of gravitational lensing is also crucial to the study of dark matter — and as we found out earlier today, that's a subject that can take as much additional research as it can get. You can check out a larger view of these galaxies in the image on the left - click it to expand.